This patient reported to our office after a serious accident in which he broke several teeth. 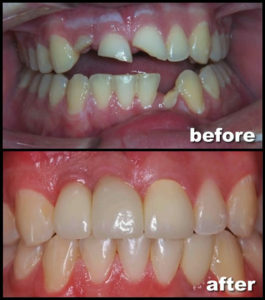 Two of his upper front teeth and one lower tooth were not able to be retained. We had to extract those three teeth. He also broke two other teeth and needed root canals. We placed dental implants to replace the missing teeth and placed crowns over them. Crowns were also placed on the other broken teeth.